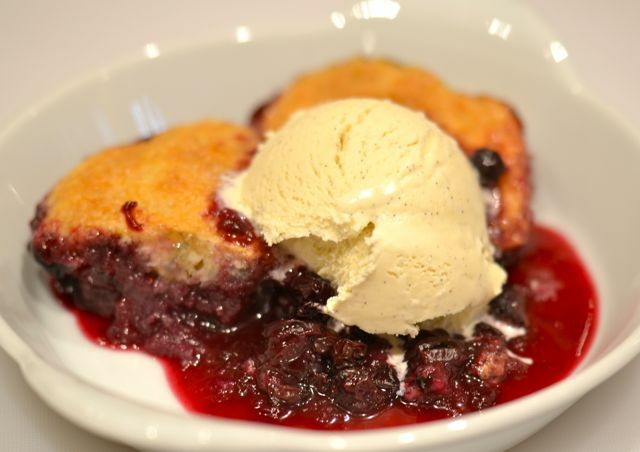 Blueberry slump with vanilla ice cream. 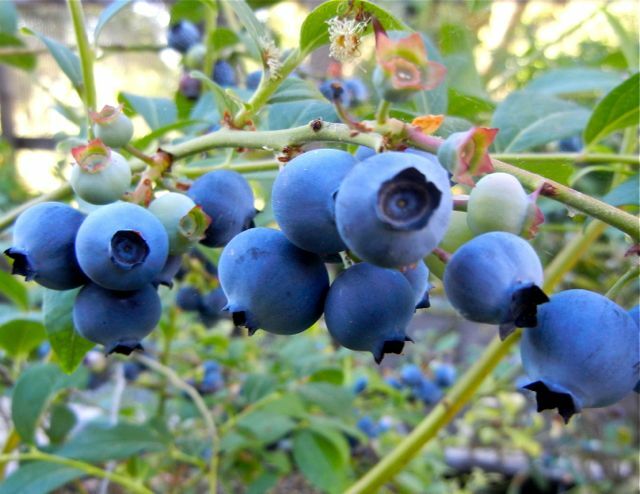 We are in full berry season here at the farm and the blueberries are in their prime. Two of the bushes are at their peak and we pick 2-4 cups of berries a day. In a week or two, it may be even more, as our slower bushes will catch up. Happy times at the farm. The only problem is what to do with all the berries. These are good problems to have. There are a few ways to deal with an abundance of berries; eat them (duh), share them, freeze them or cook/bake with them. We do them all. It is particularly worth noting that blueberries freeze well. One of the problems with trying to cook with freshly picked blueberries is having the volume to make big desserts like the slump. But if you freeze the berries you can build up some inventory, and with almost no loss of quality. To freeze blueberries simply place them on a sheet pan and put them in the freezer for a day (they don’t stick together this way). Then put the berries in a container in the freezer. They will keep for months. In this recipe we ended up using 1/2 fresh and 1/2 frozen berries and it was great. We have lots of blueberries, times are good. 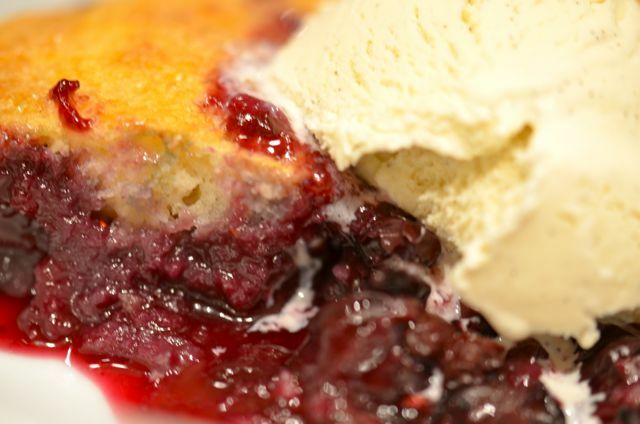 As for cooking and baking with blueberries, we have a pretty constant supply of blueberry muffins and pancakes but Carolyn likes to make other blueberry desserts, and this gets us to the blueberry slump. We recently saw an article on blueberries in Saveur and it included a recipe. You could say we adapted the recipe, but it really was just a reminder. 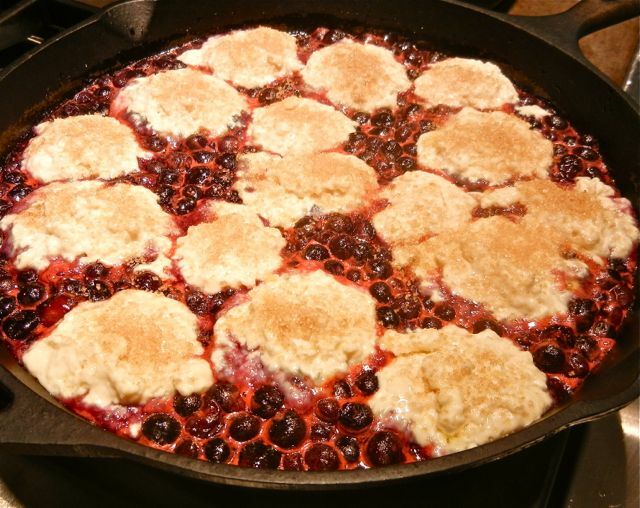 Carolyn makes slumps and cobblers often in summer, as they are an easy way to enjoy fruit in a dessert. Making a slump is about as easy as dessert baking gets (Carolyn thinks the “Lazy Daisy” is the easiest dessert- recipe soon). Basically you heat the fruit in a skillet with some sugar and juice, then top it all with a quick biscuit dough and bake in the oven. The whole thing takes less than an hour, and only 10-15 minutes of active time, and you use one bowl and one skillet. You can even make the biscuit dough ahead of time. And the slump tastes great. As it should. Pretty much everyone likes fruit, sugar and biscuits. Add some ice cream and you start getting close to dessert nirvana. 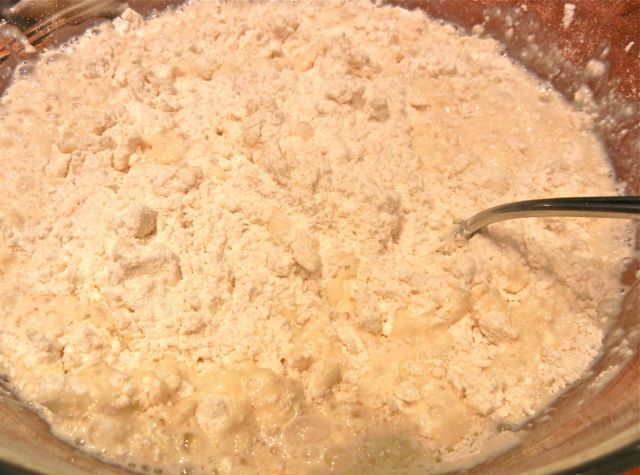 Make some quick biscuit dough. Boil berries, citrus juice, sugar and salt to dissolve the sugar. Top the berry mixture with the biscuit dough and sprinkle sugar on top. As for the name, we have no idea why it’s called a slump. 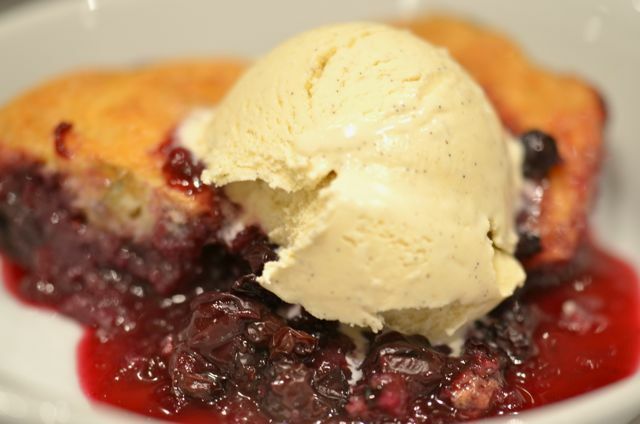 You can also call this type of dessert a grunt or a cobbler. 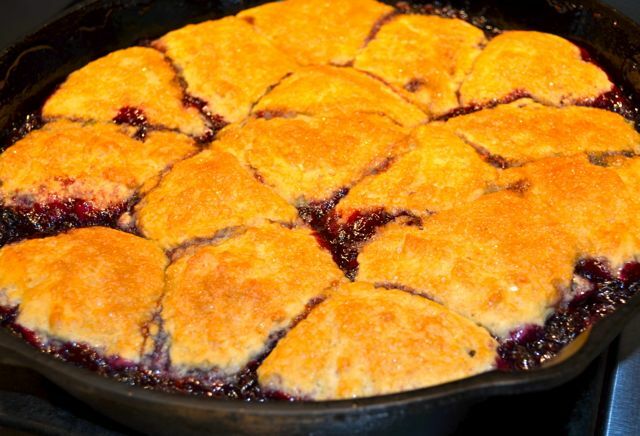 The name “cobbler” comes from the cobblestone appearance of the biscuits on top of the fruit. The name “grunt” comes from the bubbling sound in the oven. In North Carolina there is a deep-dish variant called a “sonker”. If you use an oat streusel or topping you get a “crisp” or a “crumble”. If you mix the fruit with the batter you get a “buckle”. And if you push the crust into the fruit while baking you get a “pan dowdy”. Sometimes this kind of thing can make your head hurt. But regardless of the name, this kind of baking is a great use of summer fruit. Fresh berries and stone fruits like peaches are very good in slumps, or cobblers, or grunts, or buckles…They are easy to make and easy to serve to a group. They also keep well in the fridge and are good cold or reheated. So the next time you have a bunch of summer fruit on hand, make a slump, and call it whatever you want, just bring over some friends and family and enjoy. Fresh or frozen blueberries will work for this dish. A sprinkle of turbinado or “raw” sugar on top adds great color, extra crunch and flavor. It is an extra step worth making if you have “raw” sugar. What You Get: An awesome summer fruit dessert with very little work. What You Need: You do need a cast-iron or enameled skillet. No other special equipment required. How Long? Less than 1 hour and only 10-15 minutes of active time. This is an anytime dessert and since you can make the dough ahead of time you can bake it during dinner and get dessert right out of the oven. In a large bowl, whisk together flour, 1/4 cup of the sugar, baking powder and 1/2 teaspoon of the salt. Add the butter and run butter in to the mixture using your fingers. Combine until you reach pea-sized crumbles. Add the milk and stir until a moist dough forms. Cover and refrigerate if using later. Place a rack in the middle of the oven and heat to 400 degrees. 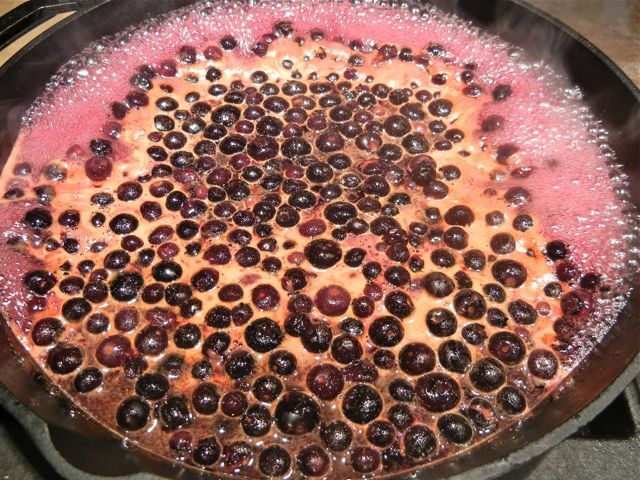 Meanwhile, in a large (12 inch) cast iron skillet over high heat, combine the blueberries, citrus juices and the remaining sugar and salt. Bring to a boil and cook until sugar dissolves. Remove the skillet from the heat. Using a dough scoop or two tablespoons, portion the dough into 2-3 inch dumplings and place them evenly on top of the fruit mixture. Sprinkle with the turbinado sugar. Bake in the oven until the biscuits are fully cooked and golden brown and the blueberry mixture reduces in volume, about 25 minutes. Serve warm and add some vanilla ice cream, if you like. It’s a great dessert, if you have the berries give it a try. Thanks for reading! Yum! Looks delicious! Can’t wait to try to make it for my family. I love this post–we often have the cobbler/buckle/crisp conversation at work–I have never heard of grunt, sonker or slump! Thanks for sharing! I’m jealous of your fresh blueberries, they are the best, and your dessert looks lovely! I’ve been explaining the difference between cobblers, crisps, slumps, dowdys, buckles, etc to my family all week and they just giggle and shake their heads at me. It’s nice to find my people here, lol. Thanks for the great post! Great pudding! Fantastic with gooseberries to. do you know if a slump can be frozen? Hi. You could freeze the whole thing but the crust may get a bit soft or gummy. You can easily freeze the fruit and then use it in the slump- that works really well. And since making the slump is so easy, we suggest freezing the fruit and then making the slump when you want it.